West Bromwich Albion earned their first league win of the season thanks to Peter Odemwingie's early strike. Winless Norwich made a shaky start and it allowed the pacy Nigerian to convert a long pass from Nicky Shorey after three minutes. Graham Dorrans thumped the home woodwork before young Norwich keeper Declan Rudd made a second-half penalty save from Odemwingie. But it did not prove decisive as Steve Morison headed wide late on. There was still time for more controversy as James Vaughan was left with blood streaming from his mouth following a stray elbow from Baggies defender Gabriel Tamas. Many Baggies fans would have been eagerly awaiting seeing Shane Long and Odemwingie line up for the first time together in attack before kick off. And it did not take long for them to have an impact. Ritchie De Laet failed to intercept Shorey's long ball and Odemwingie pounced to poke home past 20-year-old Rudd. The keeper, making his full Premier League debut in place of the suspended John Ruddy, looked nervous as he lined up in the tunnel before kick-off. And the goal did nothing to calm the youngster or his more experienced team-mates in a jittery opening for Norwich. 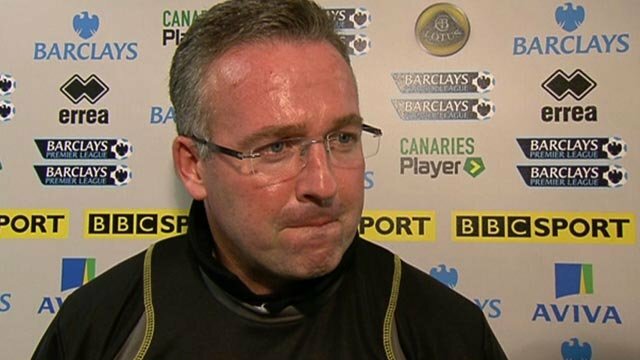 Eventually Paul Lambert's men did start to settle and fashioned their first chance when Chris Martin and Andrew Surman combined down the left before skipper Grant Holt scuffed wide. Two further chances fell to Elliott Bennett, who scooped over and then stung the palms of Ben Foster in quick succession, as Norwich seemed to stir from their early slumber. However, the game soon swung to the other end with the visitors constantly looking to expose Norwich's defence through Odemwingie. His speed caused real problems for De Laet throughout and the Belgian defender was grateful to see Rudd collect a long ball ahead of the West Brom attacker shortly after the half-hour mark. Moments later Odemwingie's skill left Marc Tierney for dead before a fizzing right-wing cross evaded the head of strike partner Long by millimetres. Scottish winger Dorrans thought he had doubled Albion's lead when his sweetly-struck strike flew past the despairing Rudd - only to cannon back off the post. After the break Norwich enjoyed plenty of possession without being able to create any clear-cut chances, until they came within a whisker of scoring through Bradley Johnson's stinging drive. It was difficult to predict which side would grab the all-important second goal as the game passed the hour mark. Then West Brom were given a golden opportunity to seal victory when Steven Reid tumbled in the box under the close attentions of Morison. But Rudd superbly denied Odemwingie with a full stretch to his right to give his side a glimmer of hope. However, they could not capitalise on this fortune, with Wales striker Morison heading Tierney's cross agonisingly wide. West Brom match-winner Peter Odemwingie said: "It was a difficult game - everyone saw we had to hold on. But it was very important to win away especially after three defeats. "I was delighted to score. I was lacking confidence but scoring in the first five minutes gave me the state of mind I needed and that helped for the rest of the game. "We knew Norwich played with a high line so that is why we needed players with speed who could run behind the line. 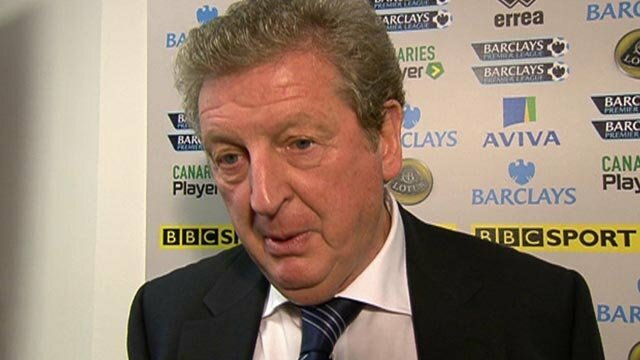 "[For] the last 10 minutes I was praying they didn't get an equaliser." 90:00+6:39 The game is over, as the referee blows his whistle. 90:00+6:13 Bradley Johnson delivers the ball, Paul Scharner manages to make a clearance. 90:00+6:04 The ball is sent over by Marc Tierney, Nicky Shorey makes a clearance. 90:00+4:34 Bradley Johnson has a direct shot on goal from the free kick. 90:00+4:34 Booking Steven Reid goes into the book for unsporting behaviour. 90:00+4:26 Free kick awarded for a foul by Steven Reid on Steve Morison. 90:00+2:49 Marc Tierney produces a cross, save made by Ben Foster. 90:00+2:39 Kyle Naughton produces a cross, clearance by Steven Reid. 90:00+2:32 Steve Morison sends in a cross, clearance by Gabriel Tamas. 90:00+0:36 The ball is delivered by Marc Tierney, Gabriel Tamas makes a clearance. 89:11 Youssouf Mulumbu concedes a free kick for a foul on Wesley Hoolahan. Shot comes in from Bradley Johnson from the free kick. 87:51 Steven Reid gives away a free kick for an unfair challenge on Steve Morison. Free kick crossed by Bradley Johnson, clearance made by Gabriel Tamas. 87:15 Substitution Shane Long goes off and Somen Tchoyi comes on. 86:58 The ball is delivered by Kyle Naughton. 86:07 The ball is crossed by Marc Tierney, Steve Morison has a headed effort at goal from deep inside the area missing to the left of the target. 85:57 Wesley Hoolahan crosses the ball, clearance made by Steven Reid. 85:16 James Vaughan produces a right-footed shot from just outside the box that misses to the right of the target. 84:37 Chris Brunt crosses the ball. The official flags Shane Long offside. Declan Rudd takes the free kick. 84:04 Centre by Bradley Johnson. 83:24 Substitution Chris Brunt on for Jerome Thomas. 81:48 The referee blows for offside. Indirect free kick taken by Declan Rudd. 79:55 Andrew Crofts takes a shot from deep inside the box clearing the bar. 79:06 Andrew Crofts produces a left-footed shot from just outside the box that misses to the right of the target. 79:00 The ball is sent over by Steve Morison, Gabriel Tamas makes a clearance. 76:31 Corner taken right-footed by James Morrison, Shot from just outside the box by Jerome Thomas misses to the right of the goal. 76:21 Jerome Thomas delivers the ball. 75:42 Inswinging corner taken right-footed by James Morrison, Paul Scharner takes a shot. Shane Long gets a block in. 75:42 Penalty taken by Peter Odemwingie saved by Declan Rudd. Norwich 0-1 West Brom. 74:35 Booking Booking for Ritchie De Laet for dissent. 73:47 Foul by Marc Tierney on Shane Long, free kick awarded. James Morrison crosses the ball from the free kick right-footed from right wing, Unfair challenge on Steven Reid by Steve Morison results in a Penalty. 73:17 Free kick awarded for a foul by Elliott Bennett on Jerome Thomas. Jonas Olsson takes the free kick. 73:00 The ball is crossed by James Morrison, save by Declan Rudd. 72:39 James Morrison takes a shot. Ritchie De Laet gets a block in. 72:01 Marc Tierney crosses the ball, save by Ben Foster. 71:18 The ball is delivered by Wesley Hoolahan, Ben Foster makes a save. 68:25 Substitution Chris Martin leaves the field to be replaced by James Vaughan. 68:25 Substitution Steve Morison on for Grant Holt. 68:25 Outswinging corner taken right-footed by James Morrison from the right by-line, Paul Scharner produces a header from inside the area that goes over the bar. 68:25 Substitution James Morrison on for Graham Dorrans. 68:25 Peter Odemwingie crosses the ball, clearance by Ritchie De Laet. 63:16 The ball is crossed by Kyle Naughton, Gabriel Tamas manages to make a clearance. 62:25 Shot from outside the area by Andrew Crofts misses to the left of the goal. 62:04 Elliott Bennett crosses the ball, save by Ben Foster. 61:22 Substitution Wesley Hoolahan replaces Andrew Surman. 59:22 Grant Holt concedes a free kick for a foul on Jonas Olsson. Direct free kick taken by Ben Foster. 58:29 Jerome Thomas takes a shot from just outside the penalty area which clears the crossbar. 57:01 Elliott Bennett delivers the ball. 55:32 Shot by Bradley Johnson from a long way out goes over the crossbar. 54:22 Peter Odemwingie takes a shot. Declan Rudd makes a save. 53:17 Ritchie De Laet is penalised for handball and concedes a free kick. Free kick crossed right-footed by Graham Dorrans, Kyle Naughton manages to make a clearance. 50:01 The referee gives a free kick against Elliott Bennett for handball. Nicky Shorey takes the direct free kick. 49:16 Centre by Elliott Bennett, Steven Reid makes a clearance. 47:24 Andrew Surman crosses the ball. Effort on goal by Andrew Crofts from just inside the penalty area goes harmlessly over the target. 46:46 The ball is swung over by Shane Long, save by Declan Rudd. 45:00+1:55 The players leave the pitch at half time. 45:00+0:12 Free kick awarded for a foul by Peter Odemwingie on Bradley Johnson. Bradley Johnson restarts play with the free kick. 44:22 Ritchie De Laet gives away a free kick for an unfair challenge on Peter Odemwingie. Graham Dorrans restarts play with the free kick. 43:20 Foul by Jonas Olsson on Grant Holt, free kick awarded. Leon Barnett restarts play with the free kick. 40:46 Free kick awarded for an unfair challenge on Ritchie De Laet by Peter Odemwingie. Direct free kick taken by Declan Rudd. 39:53 Shot by Graham Dorrans from 25 yards. Save made by Declan Rudd. 39:36 Drilled shot by Graham Dorrans bounces off the post. 38:31 Free kick awarded for an unfair challenge on Grant Holt by Nicky Shorey. Direct free kick taken by Kyle Naughton. 37:51 Grant Holt concedes a free kick for a foul on Jonas Olsson. Ben Foster restarts play with the free kick. 37:17 The ball is swung over by Peter Odemwingie. Shot by Jerome Thomas. Declan Rudd makes a save. 36:55 Marc Tierney produces a cross, Paul Scharner makes a clearance. 35:21 Graham Dorrans takes a shot. Save by Declan Rudd. 35:08 Peter Odemwingie takes a shot. Save by Declan Rudd. 34:08 Unfair challenge on Peter Odemwingie by Marc Tierney results in a free kick. Graham Dorrans takes the free kick. Steven Reid delivers the ball. 33:05 Elliott Bennett takes a shot. Save made by Ben Foster. 32:40 A cross is delivered by Elliott Bennett, clearance by Paul Scharner. 32:27 The ball is crossed by Elliott Bennett, clearance by Graham Dorrans. 32:01 Elliott Bennett takes the inswinging corner, Shane Long manages to make a clearance. 31:55 The ball is swung over by Marc Tierney, Jonas Olsson makes a clearance. 29:41 Marc Tierney crosses the ball, Effort on goal by Elliott Bennett from inside the penalty area goes harmlessly over the bar. 29:17 Elliott Bennett delivers the ball. 28:03 Shot from outside the area by Youssouf Mulumbu misses to the left of the goal. 27:52 Centre by Steven Reid, clearance by Andrew Crofts. 27:32 The ball is delivered by Steven Reid, clearance by Bradley Johnson. 26:11 Free kick awarded for a foul by Bradley Johnson on Jerome Thomas. Nicky Shorey takes the direct free kick. 26:01 Andrew Surman produces a cross, Nicky Shorey manages to make a clearance. 25:47 Shot by Bradley Johnson. Blocked by Gabriel Tamas. 25:40 The ball is crossed by Grant Holt, Gabriel Tamas manages to make a clearance. 25:01 Shane Long concedes a free kick for a foul on Leon Barnett. Declan Rudd takes the direct free kick. 22:36 The ball is sent over by Jerome Thomas, Kyle Naughton makes a clearance. 20:33 Kyle Naughton fouled by Jerome Thomas, the ref awards a free kick. The free kick is delivered right-footed by Kyle Naughton from right wing, clearance made by Gabriel Tamas. 20:24 Bradley Johnson sends in a cross, Ben Foster makes a save. 19:47 Andrew Surman takes a shot. Save by Ben Foster. 19:27 Effort from 20 yards by Peter Odemwingie. Blocked by Leon Barnett. 18:32 Andrew Crofts gives away a free kick for an unfair challenge on Youssouf Mulumbu. Free kick taken by Ben Foster. 18:25 A cross is delivered by Marc Tierney, clearance by Gabriel Tamas. 17:35 Unfair challenge on Jerome Thomas by Kyle Naughton results in a free kick. Free kick taken by Jonas Olsson. 17:24 The ball is swung over by Andrew Crofts, save made by Ben Foster. 17:14 Centre by Marc Tierney, Gabriel Tamas makes a clearance. 15:59 Free kick awarded for an unfair challenge on Chris Martin by Jonas Olsson. The free kick is delivered left-footed by Bradley Johnson from right channel, clearance by Jonas Olsson. 15:22 Booking Booking for Paul Scharner for unsporting behaviour. 13:31 Jerome Thomas sends in a cross, save by Declan Rudd. 10:22 The ball is delivered by Elliott Bennett, Header from deep inside the area by Andrew Surman goes harmlessly over the crossbar. 10:11 Drilled right-footed shot by Andrew Crofts. Jonas Olsson gets a block in. 9:12 The ball is crossed by Marc Tierney. 8:48 The ball is swung over by Elliott Bennett, volleyed shot by Bradley Johnson. 8:01 The ball is swung over by Andrew Surman, Ben Foster makes a clearance. Effort from close in by Grant Holt goes wide left of the target. 5:46 Free kick awarded for an unfair challenge on Grant Holt by Jonas Olsson. Kyle Naughton takes the direct free kick. 4:28 Centre by Bradley Johnson, clearance made by Jonas Olsson. 2:05 The assist for the goal came from Nicky Shorey. 2:05 GOAL - Peter Odemwingie:Norwich 0 - 1 West Brom Peter Odemwingie grabs a goal from inside the penalty area to the bottom right corner of the goal. Norwich 0-1 West Brom. 0:51 Shane Long is ruled offside. Free kick taken by Declan Rudd. 0:41 The ball is crossed by Steven Reid.